Emissions policies are usually expressed as percentage reductions in emissions compared to an historical or projected baseline. This presents emissions cuts as a flow problem. If we can turn the tap down a bit, we can address the problem. But atmospheric carbon — as the paleoclimate data shows — is not a flow problem, it’s a stock problem. Every tonne of carbon we add to the atmosphere makes two things worse: long term warming and the sea level rise that results from it, and ocean acidification. The best evidence available to us from modelling studies suggests that it is possible for the world to limit warming over the next century to between 1.5ºC (the target endorsed by 100+ of the nations of the world) and 2ºC (the target endorsed by the rest of the world – including NZ), but that the reductions in emissions from current levels will have to be steep and start now. The carbon budget left — the amount we can burn and still hit those targets is not big, and the world is getting through it at great speed. In order to have the best chance of hitting those temperature targets, we will have to go beyond cutting emissions to creating a global economy which is below net-zero emissions (this is explicit in the most aggressive IPCC emissions scenarios). This means that to limit near term warming, in the second half of this century we will have to start reducing atmospheric greenhouse gas levels. Every tonne of CO2 we emit today will eventually have to be removed from the atmosphere. If we want to prevent the full extent of the sea level rise suggested by the historical data we will have to return atmospheric carbon loading to near pre-industrial levels — a huge task for us to bequeath to our children. The available carbon budget has to be allocated equitably between nations. NZ, as a rich developed country with high per capita emissions will be expected to shoulder a greater burden than rapidly developing and underdeveloped countries. This is both a moral and an ethical issue, as well as a matter of realpolitik in relations with China, India, the US and Europe. There are two sorts of climate risk that face New Zealand. The first is of direct and indirect climate change impacts. Climate change is already being felt all round the world in increasingly damaging extreme weather events, and this will only get worse as warming continues. NZ may (or may not) escape the worst of those direct impacts, but our trading partners almost certainly won’t. We are at least as vulnerable to the impacts of climate change on our key export markets as we are to — say — an outbreak of foot and mouth disease damaging our beef and dairy exports. Some of these direct impact risks are unavoidable. Due to the huge heat capacity of the global oceans, initial “fast” warming lags behind CO2 levels by up to 30 years. If we could somehow freeze atmospheric CO2 at 400 ppm, the planet would continue to warm for another three decades. Every year we delay cutting emissions adds a year to the end of the process — when the damages being experienced both here and overseas will be much greater than today. The only way to deal with the unavoidable warming is to increase national resilience to the direct impacts of extreme weather, sea level rise and climate warming, and to create an economy that is less vulnerable to climate shocks in export markets. The preponderance of scientific and expert evidence is handily summarised by the Intergovernmental Panel on Climate Change in its regular reports. The most recent, published last year, makes for grim reading, but also makes it clear that it is possible for the world to limit the worst impacts of climate change, and do so at affordable cost. To assume that the IPCC is wrong, or “alarmist” as some would like to suggest, and that future climate change will be less damaging than currently projected, is to fly in the face of the evidence. From a risk analysis perspective, basing climate policies (global or national) on a gamble that the experts are wrong could have terrible consequences in both the near and long term. However, it should be pointed out that the IPCC is itself regarded by many in the climate science community as a conservative presentation of the evidence. Since the publication of the Fifth Report, for instance, it has become clear that large parts of the West Antarctic Ice Sheet may already have passed the point of no return and could be committed to large scale melt over the next century. In other words, it might be wise to assume that we should be planning to avoid the worst case. It is often suggested that we should prepare to cope with 4ºC of warming, but mitigate (by aggressively cutting emissions) to give us the best chance of staying under 2ºC. The second dimension of climate risk facing NZ is the geopolitical risk – the consequences that our climate policy actions have in terms of our international relationships. The present government has defined itself as a “fast follower” — not seeking to lead on actions to reduce emissions, but prepared to follow overseas efforts as they ratchet up. The recent agreement between the US and China on emissions demonstrates that the overall level of global climate ambition has increased. Any target that NZ sets has to be seen to be both ambitious in that context, and should represent a significant increase on the targets currently tabled. In the wider context, if international action to cut emissions is going to accept the reality that the global economy will have to go beyond net-zero emissions in the second half of this century, then NZ should be positioning itself to reach net zero emissions by 2050 — preferably earlier — and perhaps aim to be a global centre of excellence for carbon sequestration. From a strategic perspective, the government needs to realise that climate policy is not an optional extra. The climate problem is not going to go away, and while it may be possible to delay implementing effective policy for a few more years, the longer it is left the more expensive introducing those policies will be because faster and steeper cuts will be required. It will be much more economically efficient to make sure that a wide range of policy tools are put in place and their impacts ramped up over time, than to try to slam on the brakes in a few years time when international action — perhaps as a result of damaging climate impacts — really ramps up. The discussion document issued by the MfE makes considerable play of the costs to NZ taxpayers of actions to reduce emissions, though as I and others have pointed out, the assumptions underlying the economic modelling are flawed and unhelpful when considering any sensible cost benefit analysis of emissions policy settings. In one respect – and one respect only – the economic modelling commissioned to examine the costs of various emissions targets is very useful. If we take the emissions targets currently adopted by the government as the baseline (rather than the ridiculous base case of no action to cut emissions by anyone, anywhere), then we can see that the costs of increasing the ambition of targets is actually rather small. If the necessity for emissions reductions were to be spread across the whole economy — rather than excluding half of national emissions by assuming that the rest of the economy is prepared to subsidise agricultural emissions, then the costs would likely drop further. There are also considerable benefits to be obtained by moving towards a low emissions economy. There will be economic benefits from technology development, innovation and transitioning to clean fuels, as well as encouraging agriculture to diversify out of high emissions farming systems and into high value, low emissions crops with greater resilience to the impacts of warming. The Ministry’s discussion document makes little or no mention of the costs of inaction, despite the fact that Treasury has calculated that they could be as large as $52 billion by 2030. With current emissions policy settings — a weak ETS that effectively subsidises big emitters and deliberately excludes emissions from agriculture — there is a danger that the economy will become locked in to a higher emissions profile than necessary. If the likely future cost of carbon is not factored into current infrastructure and capital investment decisions, then NZ risks creating an economy riddled with carbon sclerosis — a disease that will be ever more expensive to cure as global action to emissions tightens. The government appears to be planning to meet NZ’s current commitments by purchasing emissions reductions on the global market, and seems to expect that this will be the most cost-effective way of meeting future emissions targets. This increases the future economic risk to the country by effectively encouraging the domestic economy to take a high emissions pathway. 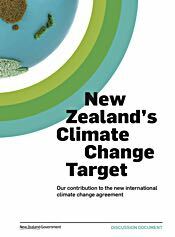 NZ will therefore be vulnerable to any steep rises in the cost of emissions trading units. Since a tightening of future international emissions policies is practically certain if worst-case climate impacts are to be avoided, this amounts to a strategic blunder of considerable proportions. Tighten up ETS settings to reduce grandfathering of emissions for big emitters and increase the carbon price signal to all emitters currently covered by the scheme. Bring agriculture into the ETS as soon as possible, in order to allow farmers and foresters to make sensible investment decisions. Require that a minimum proportion of NZ emissions units are used to settle ETS positions. Encourage afforestation and native bush regeneration to enlarge NZ’s standing carbon stock. Expand the permanent forest sink initiative and encourage co-cropping in permanent forests (fungi, plants, biofuels). Put in place rules that allow selective timber harvest that doesn’t reduce standing carbon stock. Phase out all fossil fuel electricity generation as soon as possible. Phase out all non-essential road building and divert funds to rail and coastal shipping and public transport networks to encourage a shift of freight from road to rail and sea, and greater use of public transport systems in urban areas. Phase out all support for coal production and oil exploration. Step up research into biofuels and incentivise the roll-out of practical systems to reduce liquid fossil fuel use. Introduce minimum fuel efficiency standards for all imported vehicles. Expand support for electric vehicle use. Continue and expand energy efficiency initiatives for all buildings, domestic and commercial, and encourage insulation of existing housing stock. Incentivise renewable energy installations at all scales, and fund the development and installation of smart grid technologies that allow domestic and small-scale renewable generation projects to integrate with the national grid. These policies will require a whole of government approach to emissions management and reduction. Implementing them will need a mixture of market mechanisms (via the ETS or carbon taxes) and carefully designed regulation. It is important for all New Zealanders that government delivers a consistent set of policies that are designed to allow NZ to reach net zero emissions over the next 35 years. To this end, I strongly believe that climate policy should not be a political football, liable to constant change after every election. The government should work to build a cross-party consensus on emissions policy tools and settings, a “climate accord” that allows NZ to implement meaningful emissions reductions over the long term and to build social and economic resilience to the climate changes that are now inevitable. Given the above, I believe that New Zealand should gazette a “net zero” by 2050 target, and consider all intermediate targets as waypoints on the route to that goal. As a gesture of our renewed commitment to action (and in recognition that the major international emitters are now committed to serious cuts), the current 5% reduction on 1990 emissions by 2020 target should be immediately increased to 15%, a 2030 goal be set at 40% below 1990 and a 2040 goal be set at 70%. These targets are credible and achievable, but will require the current government to do more than pay lip service to climate policy. It remains to be seen whether that is a credible and achievable goal.